Back on a Monday morning and in action at the office! 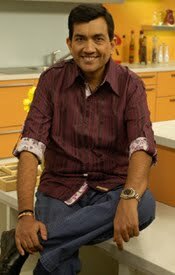 Did finish the shoots for the new format of Sanjeev Kapoor’s Kitchen, i.e., Teen Patti on Saturday. 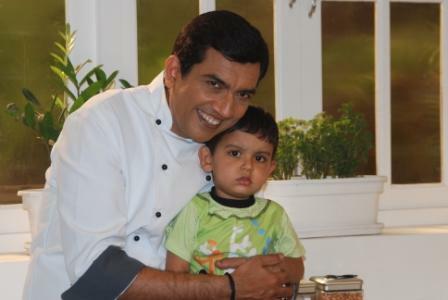 Was as usual hectic, but had fun as my little nephew, Manit, was there on the sets! Did manage to relax on Sunday though, with a fun-filled luncheon with good friends Dr. Ram and Meena Prabhoo. All of us had a great time together with laughter and masti! As for today, I finally managed to get some time to check on the renovations going on in the office, before I left for the first board meeting which was scheduled today at Sahara Star. We are expanding now, and we do need more space in the office to accommodate more and more people. The developments have been happening for quite some time now, so it was necessary on my part to ensure things were running smoothly. During the meeting, I just happened to check with the Union Budget for the year 2011-2012. People will be really happy to know that there is a budgetary increase in the education sector by 24% and health sector by 20%. Also, a good news for the general mass lies in the tax exemption limit which has been raised from 1, 60,000 to 1, 80,000. However, somethings which have not gone well with me is the service tax that has been widened to cover hotel accommodation above Rs 1,000 per day and A/C restaurants serving liquor. The common man has also somethings to worry with the increase in the service tax on air travel and accommodation of hospital rooms as well. One lesser known or rather lesser used vegetable is the beetroot. It comes to mind simply because there are lovely beetroots right now in season…rotund, bursting with colour of good health and blood purifying properties. So why not make use of it while keeping in mind that Indian food can be light and nutritious. Try eating the beetroot leaves and stalk (boiled or steamed) and accompany with other more flavourful vegetables like onions and garlic. Or chop finely and add to stir-fries. Try Beetroot Chaas for a flavourful beginning to a meal. Beetroot’s main benefits are that it contains no fat, very few calories and is a great source of fibre. Beetroot has for many years been used as a treatment for cancer in Europe. Specific anti-carcinogens are bound to the red colouring matter which supposedly helps fight against cancer and beetroot also increases the uptake of oxygen by as much as 400 percent. Additional studies are taking place to add support to these claims. The green leafy part of the beetroot is also of nutritional value containing beta-carotene and other plant pigments. The latter function as antioxidants. This part of the beetroot also contains lots of folate, iron, potassium and some vitamin C. The roots and greens therefore are great for women in general and for those planning pregnancy. Beetroot can be eaten raw. You just need to peel it and it’s ready to use. Beetroot can add a refreshing touch to a salad, a sandwich or as an accompaniment to other vegetables. Some prefer having it thinly sliced and mixed with onion rings with a dash of lemon juice and salt. This is a nice, crunchy, pink-hued salad! And then it comes to light Indian food a kachumber can be a filling start to a meal. Otherwise grate it finely to add to other vegetables. Or try adding a teaspoon or so of finely grated beetroot to a chilled glass of fresh orange juice. It’s refreshing! When you have the time and inclination do try Amla aur Beetroot ki Tikki. You can serve cooked beetroot: as a hot vegetable accompaniment to a meal; or allow it to cool and slice it to put it in a sandwich with cucumber slices and tomato slices. You can also try this: cut beetroot into cubes and stir-fry it with some steamed cubed potatoes and pumpkin. Add a little garlic and some diced onions – this makes a delicious vegetable dish to serve with the rest of your meal. Or make a lovely rice dish like Beetroot and Mewa Pulao. Who would not want to go for a holiday? Family holidays are an intrinsic part of my life and we love it when the summer break comes and we take off for some exciting destination. I am attending the launch of the Kuoni Hoilday Report 2011 at Taj President this afternoon. It will be over only in the evening. But I could tell you that eating and drinking is an intrinsic part of any good holiday. Food in India is synonymous with luxury and leisure. This report will be sharing distinct and unique behaviour about Indians relating themselves to food during their holiday. Enjoying and experimenting with a variety of delicacies is the most noticed attitude of the Indian traveller. I am sure food, leisure and luxury holidays are going to go places in India in the near future. 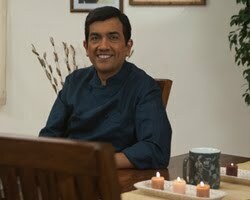 And as I get back from the holiday mode, I’ve to gear up for a shoot planned for tomorrow for an all new series of Sanjeev Kapoor’s Kitchen. FoodFood is really keeping all of us, including Alyona and me, on our toes! Adding more to the FoodFood front is a new reality show titled ‘Maha Challenge’, the registrations for which will be held pan India. I will be travelling to Ahmedabad for the first registrations which are scheduled on March 2, 2011. The registrations will be conducted in the form of road shows, where the contestants will have to register themselves on the same day. The show will feature a challenge between girls and boys, where the teams will be lead by Ms. Madhuri Dixit Nene and me, respectively. All in all, there will be a lot of travelling happening in the coming months. Looking forward to these fun-filled and adventurous, but hectic trips! What is life without curry? In fact, life is not without hurry and worry too! Jokes apart, rich and heavy curries are enjoyed only once in a while and given the modern health challenges it is best to ‘skim’, ‘trim’ and ‘slim’ the curries. Indian food has so many curries to be proud of and as there is such a vast repertoire it is not possible, given the space constraint, to give low calorie avatars of all. Curries are mostly made with a base of fat, onions, tomatoes, whole spices or even with nuts and coconut. At home, preparing curries in minimum oil is no longer an uphill task. Thanks to non-stick cooking ware and ingenuity of budding cooks! Pureed fresh spinach can make a rich base for mixed vegetables, or tender sweet corn kernels, or even paneer (as in palak paneer!). Make a puree of blanched spinach with some ginger, garlic and green chillies. Start cooking it in the tempered oil and add the masalas and vegetables or chicken. Puree fresh ripe tomatoes with ginger, garlic and green chillies. Sauté in a non-stick pan till a little dry. Then add boiled dal, or steamed vegetables and of course you can highlight the curry with red chilli powder and garam masala powder. Tomatoes are pureed with onion, garlic, ginger, cloves, cinnamon, red pumpkin, cumin seeds, kasuri methi, salt and red chilli powder. As you sauté this paste in one teaspoon of oil, keep ready some low fat milk (instead of cream) and a paste of cornflour in water with some sugar. Finish off the dish with addition of your choice (grilled chicken or marinated chicken or steamed vegetables or paneer). In a large pan put together some chicken pieces, chunks of potato, cauliflower and carrot. A handful of snow peas add colour. Bring to boil in sufficient water and add two star anise, two to three cloves, one inch stick of cinnamon, grated fresh garlic, roughly chopped green chillies, salt and crushed black peppercorns. By the time the whole thing is done the house is fragrant with a spice-laden aroma that will never let anyone know that this stew has no added fat. What is curry without rice or bread? When you are serving a curry made in a healthier way why not skip white rice and get along with brown rice? Also skip white bread and look for good quality brown bread or best still, serve rotis. Let us add a new recipe to our repertoire of healthy curries. Koftas are generally fried before being dunked in curry. But this one is different! Try Tamatar Murgh Kofta.